This is my second interview in my ‘Profiles of Inspiration” interview series. This fabulous interview is with Maria Ross, Chief Marketing Diva of Red Slice based in Seattle. Maria’s first book, Branding Basics for Small Business, was released today! NOW FOR SALE at www.brandingbasics.info. 1) What is your ultimate vision for Red Slice and do you consider this vision part of your ultimate legacy? I didn’t start Red Slice intending to build a big global branding agency or anything. I just wanted to do work I like with people I like who are passionate, friendly, smart and respectful. I was jaded by some past experiences in high tech marketing where executives were making the wrong decisions, not thinking about the long term, and who were just plain disrespectful or arrogant about people’s time and efforts. I was sick of it, so I decided to be my own boss and only work with people I selected. In this way, I can constantly build my legacy of going the extra mile, delivering quality work, and helping others build a strong company and offer value. When you come from that place of mutual respect and passion, you can climb mountains for people and know the effort will be appreciated and rewarded. I also wanted to help “clean up the marketing and brand pollution” that is out there, and help people realize that they need to be smarter about their branding. Now I’m on a mission to make entrepreneurs realize that a brand is more than a logo – and I think I’m really succeeding in that mission. My official mission is to help companies “engage, inform and delight” their customers and that is my personal missions as well. 2) What are the core values of Red Slice and do those values correlate with you personally? Red Slice is me and I am Red Slice, so everything from my Guiding Principles to my Mission are my personal ones as well. My mission is to Engage, Inform and Delight. Whether I help a business do this for their customers – or I personally do this when speaking, teaching, writing, or even acting (another passion of mine), it’s about making a connection and evoking an emotion. If more companies did business from this brand perspective, you might have more Apple’s and Nike’s in the world. In addition my Guiding Principles are: Work Hard, Play Hard; Do what you say you will do; Treat everyone with respect and honesty; The devil is in the details; Be prepared; With blessings come responsibility. Especially with that last one, I try to use my good fortune to benefit causes I care about, like animal welfare, child welfare, and getting medical help to war-torn countries. If I can use entrepreneurial success to support the causes close to my heart, then that is an amazing gift. 3) How much thought/planning/designing went into differentiating Red Slice from your competitors? Quite a bit. I could have gone the route of calling myself “Maria Ross Consulting” but coming from an ad agency background, that just seemed so boring to me. I wanted to create a business that was memorable, fresh, fun and innovative. If I’m going to help companies stand out, then I need to walk my talk, right?! Everyone and their mother seems to be a consultant these days so I wanted to find a way to package up my unique skills and experiences in a way many people were not. I also tout specific differentiators all the time, like the fact that I’ve worked on both the client and agency sides and have worked on both B2B and B2C brands – which gives me a more holistic perspective. Finally, I do not shy away from talking about my writing and acting passions: that creative edge is another differentiator for me. How many people are creative Type A personalities?! Many people told me not to do this, but I figured that again, I could attract the people I wanted to work with if I represented myself authentically. It’s a nice Litmus test! 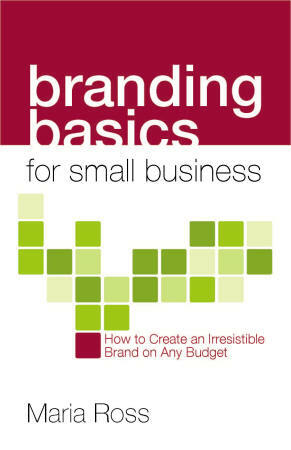 4) Congratulations on the recent publication of your book, Branding Basics! What was the best part about the experience thus far? Thanks! I’m so excited to package up all my advice and unique experiences to help people build their own strong brands and looks at branding in a more fundamental way. This was actually an unexpected opportunity but when it knocks, you really just have to answer. And I’m so proud of myself for taking advantage of the unexpected turn and publishing this book, which has been a dream since I started writing stories at 6 years old. It also feels good to pass on all these examples, good and bad, from my own work experiences and use them for the benefit of others. I really believe small business owners have such a unique opportunity to build a strong brand but they just go about it the wrong way. They think it stops at the visual design, or they cut corners, or they don’t think bigger about how every single, solitary interaction with a customer is a chance to seal your brand onto their hearts. Amazing things happen when you build a business based on passion and value – the profits soon follow when it’s done right. The book can be ordered at http://www.brandingbasics.com and is also available on Amazon, Barnes and Noble.com , Borders.com and even in Kindle format! 5) What are you most proud of as it relates to your work at Red Slice? Helping businesses “clean up” their messages or visual branding to properly tell the story they had in mind all along. That “A Ha!” moment is always a thrill for me. I work with fabulous designers and writers who can bring a vision to life: they just needed me to translate the vision in a way that could be understood. I love when clients say, “Yes! That’s exactly what I wanted to communicate!” or when they see how they have not been doing themselves any favors with selfish messaging: talking about what THEY do, rather than what CUSTOMERS want to hear. And I love the gems that form when we’re brainstorming. Business owners have the power to create their brand – they just don’t always know how to approach it or where to start. I feel like a guide in that respect and I love it. 6) How are you reaching your target market? Amazingly, all of my clients have been referrals, but I started heavily using my blog and social media to influence people. I’m a writer by nature, so the blog was a great way for me to reach my audience and deliver value. I also had to build my business from scratch, as I had just moved to Seattle and was only here 3 months before hanging my shingle. So I had to try a lot of networking groups (some fit, some didn’t), connect online, leverage Linked In, etc. My business is a referral business, so I don’t believe blind mailers will net me new clients – but that’s a brand choice I have made. I also have some dream companies in mind I’d like to work with that are in my radar – when I have time to pursue them! With referrals, initially, I was getting a lot of “Can we have coffee so I can pick your brain?” I did this a lot at first and realized I was giving away something for nothing. My product is my brain! It’s my experiences and advice and I learned early on you can’t just always give that away. So going back to the “pick the clients I want to work with” if someone can commit to a paid initial meeting, then a) I know they are serious and have budget (if they don’t have budget, you can’t waste your precious time!) and b) I could feel good about putting a little extra research and work into that meeting so it really was valuable for them. Often, these initial meetings do convert to sales because you are putting your best foot forward and they see the value of why they need you. To be honest, this still morphs and grows for me. I tested different things at first. I initially meant to pursue companies like the ones I’d worked for, but then got into the vibrant entrepreneurial small business community. Now I’ve righted the ship a bit, so to speak and balance the two. Small businesses are so much fun, but they can’t always spend in a way where you can be super successful for them. 7) What do you most dislike about being a business owner and how do you deal with that aspect of business? I’m an extrovert, so being alone is awful: no one to bounce ideas, catch you if you fall, stay up to date on Quick Books! So I network a lot and meet people out for coffee. My partners that I work with are amazing and I love to brainstorm with them. I’d say the hardest part is dealing with taxes and the books – I’m not a numbers person and the tax laws are so damn confusing, it kills me. I spend so much time trying to make sure I’m not breaking any rules! 8) What do you most enjoy about being a business owner and how much time do you get to spend doing that part of your job? Flexibility and freedom! Being able to go get a coffee in the middle of the day, or hang out with my dog or set my own schedule. It’s hard because you have to, well, “set your own schedule” and its easy to get distracted (especially with Social Media!) but I am someone who needs a bit of structure so I make it for myself. I set days of the week for client time when I can, hours for networking, try to only go to 1 or 2 events a week, etc. I need to make time to remember I’m working for myself for a reason and not let my own business consume too much of me. I set strict boundaries on weekend time (don’t log in if I can avoid it or unless there is a deadline) and try to leave my home office for the night when my husband comes home. If you don’t set those boundaries, you will lose yourself in all the freedom! 9) Where do you find inspiration as a business owner? Everywhere! From individual entrepreneurs who come to speak at networking events, to those I am just lucky enough to meet in at such groups. I get inspired by reading stories in the press of people who are following their passion and turning it into profit. I get inspiration from the big companies who do branding “the right way” and I know my efforts are not in vain. I have also tapped into some great women locally who are super sounding boards, who do really cool things, and who are blazing trails and making things happen. I get inspired by activity, progress and creativity – as well as by those who are Zen about their career, take time to breathe and enjoy life’s simple pleasures. It can be easy for small business owners to get caught up in a competitive Rat Race of their own if they are not too careful – I had to step away from some people and groups because of that. So surround yourself with people that are doing things the way you want to be doing them – not just those who are selling out, selling their soul, or working themselves to death to be successful! This entry was posted on Wednesday, June 2nd, 2010 at 6:42 pm and is filed under Building Your Brand, Business Planning, Creating Your Vision, Profiles of Inspiration. You can follow any responses to this entry through the RSS 2.0 feed. You can leave a response, or trackback from your own site. Maria is such an example of “Walking her talk.”. I am excited to read her book. Congratulations on an interesting and engaging interview. Thank you Cathy, Maria is a huge asset to not only the small business community but to the business world in general. It was an honor to be granted this interview. So glad you enjoyed it!